As soon as Mr. and I arrived at the farmhouse and signed in, we were ushered towards the vintage truck. It’s in a bright red colour and you couldn’t miss it. The truck holds around a dozen people on the benches. Then, we were taken around the farm in the truck. 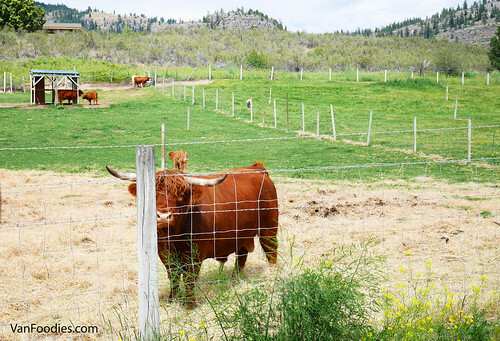 We saw the livestock – cattle, llama, etc. We walked through parts of the 26 acre vineyards. 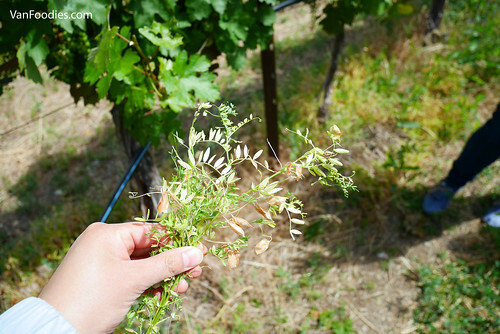 We learned that they plant lentils or mustard by the vines to control pests in the most natural way. We found out that Covert is a “salmon safe” farm, meaning nothing coming from this farm would contaminate the water and harm any wild salmons. 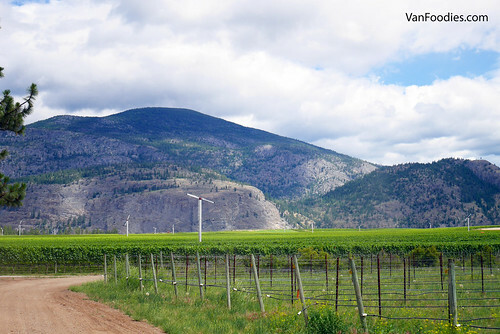 We were in awe with the view of the McIntyre Bluff. 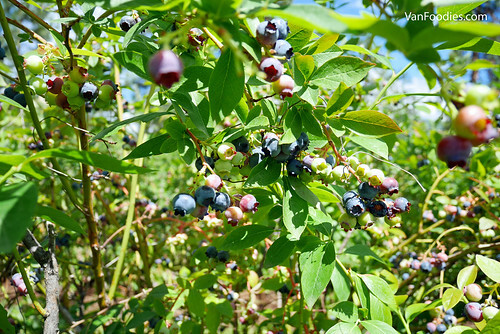 Around the corner, we were taken to the blueberry farm where we got dropped off for some u-pick time. I love u-pick! For me, for some reason, there’s some satisfaction in picking my own fruit. 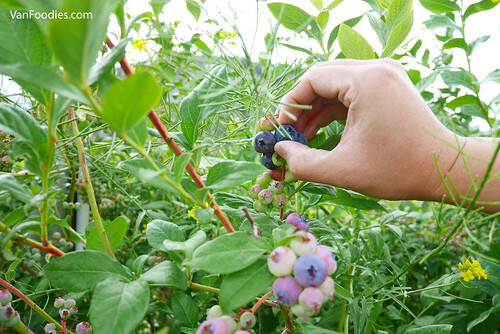 And you must agree, it’s a lot of fun when you get to stroll along blueberry bushes, and pick and eat blueberries right off the bushes. 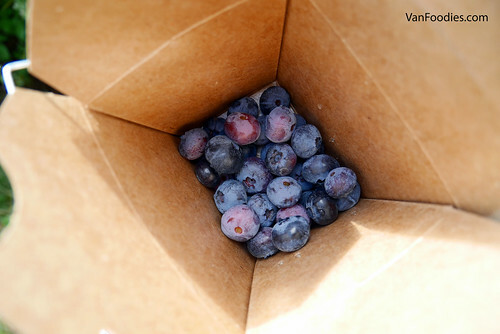 The blueberries are grown organically here so we didn’t have to worry about bug spray or anything. 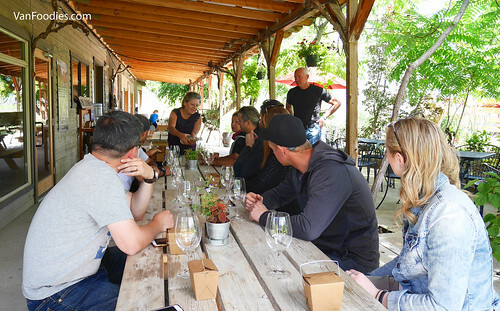 The second half of the farm experience was wine tasting. 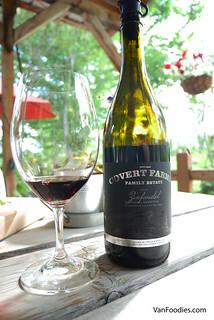 Covert Farms has been a wine producer since 2005. They hand picked their grapes, let them ferment naturally, give as much love and attention to the fruit as they possibly can. 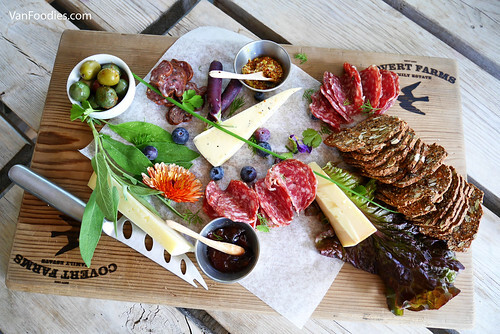 The wine tasting also included a beautiful charcuterie board, filled with locally sourced ingredients and farm fresh produce. 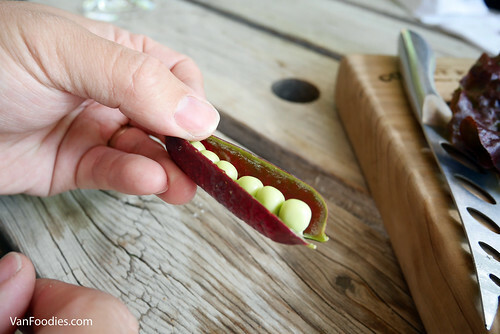 While my eyes and hands were focused on the 3 types of cured meat and 3 types of cheese on the board, I was most fascinated by the purple peas that were farmed here. Crunchy, sweet, beautiful in looks as well. 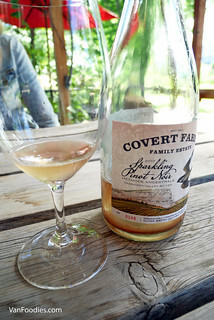 The Sparkling Pinot Noir had a lot of pear notes. It was naturally fermented in stainless steel tanks and then gravity fed directly into bottles where fermentation finished without intervention. 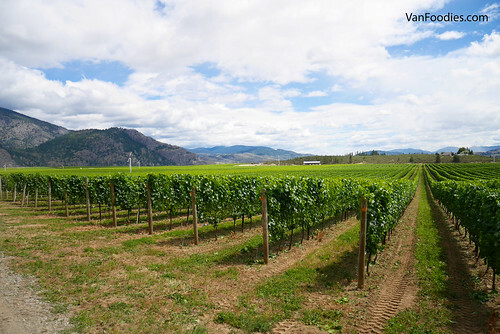 The Sauvignon Blanc Semillon was crisp with a slight mineral finish expected from a sauvignon blanc. 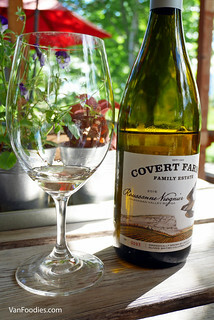 The Roussanne Viognier was full of stone fruit note – apricots and peaches. 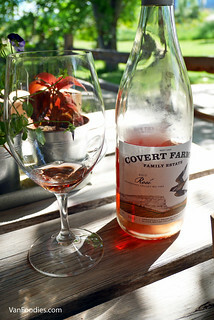 The strawberry-forward Rose was made with mostly Merlot and Pinot Noir with just 2% of barrel aged Syrah for its peppery note and tannins. 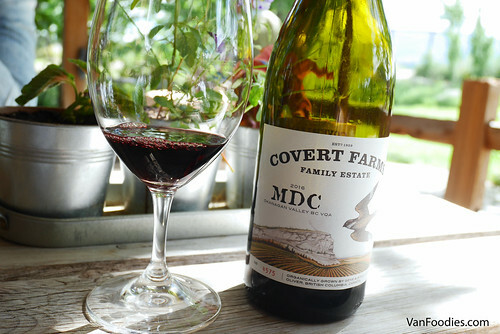 MDC – Cabernet Sauvignon, Syrah and Zinfandel blend – is named after owner Gene’s late father Michael Dunham Covert. Michael was a huge fan of Cab Sauv and not convinced about Zinfandel and Syrah, so Gene decided to add some Zinfandel and Syrah to the mix. And the result is a well balanced red, with lots of fruity berry notes and just a hint of spice from the Syrah. My favourite wine from the tasting. The Zinfandel Grand Reserve has spent 20 months in French and American oak. 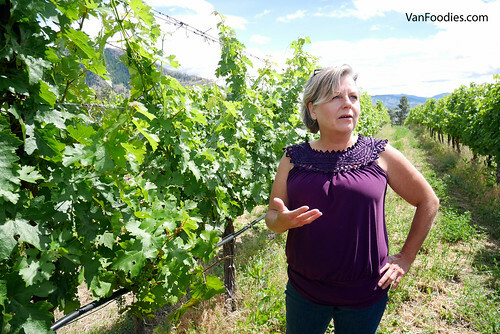 It’s not usual to find zinfandel in the Okanagan so it was a pleasant surprise. It has a hint of black pepper and plum/fig note. Last but not least, the Cabernet Sauvignon Grand Reserve has spent 22 months in French oak. It was the most full-bodied of all reds, yet fruity and relatively smooth. You can drink now but can definitely spend some time in a wine cellar. 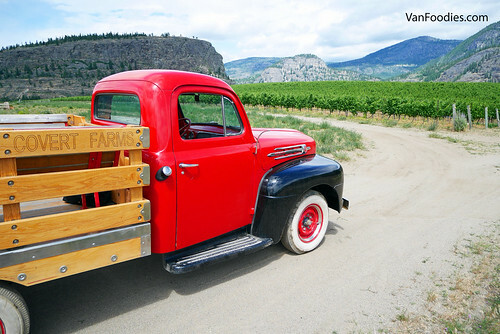 It sure was a lot of fun doing the farm tour at Covert Farms, especially on the vintage pickup. Staff were friendly, knowledgeable, and passionate about the operation. 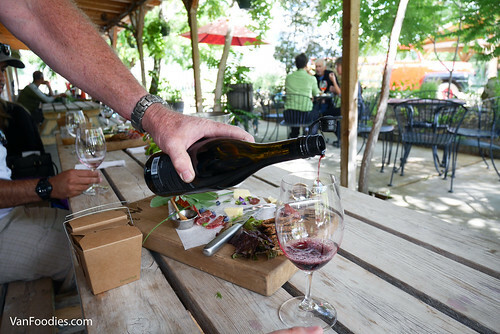 Their wines were all quite delicious; I especially enjoyed the red wines. 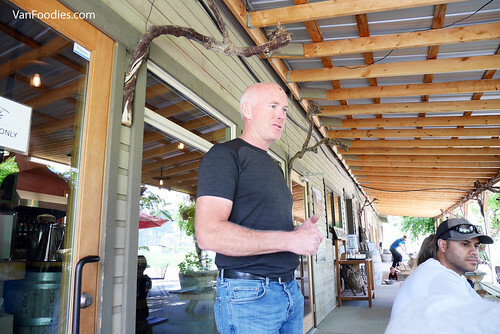 Mr. may even have a tiny man crush on Gene, the owner – when you meet him in person, you’ll notice the charm and star quality in him. 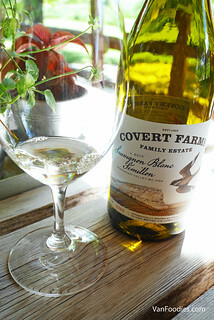 The 1.5-hour farm tour at Covert Farms costs $59 per person (kids 5-18 years old only $20). Reservations are highly recommended. 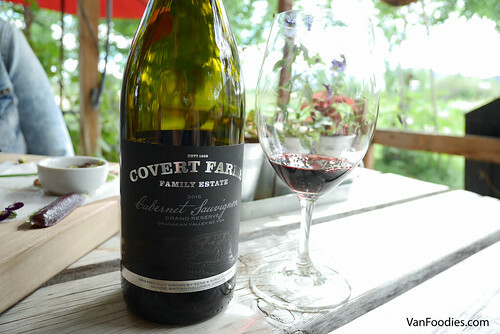 Disclosure: The farm tour was provided to us complimentary of Covert Farms. However, the views and opinions expressed are my own.